This condition is also known as cat scratch syndrome or cat scratch disease (CSD). 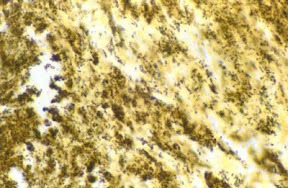 In technical terms it is called “benign lymphoreticulosis”. It can also be called “Bartonellosis” after the bacteria causing the condition (see below). This is not a disorder/disease of the cat but the human. Rarely, when scratched, bitten or licked by a healthy cat a person can contract this disease. This is a zoonotic disease (transferable from animal to human). About 40% of cats carry the bacteria that causes the disease (Bartonella henselae – see below) at some time in their lives. In a study carried out in Italy (src: http://www.pubmedcentral.nih.gov), the prevalence (how commonly occurring) of Bartonella henselae in urban stray cats was evaluated in late 1999, early 2000. 18% of the cats tested had the bacteria in their blood (bacteremia). 38% of the cats tested for the presence of the relevant antibodies were positive (seropositive). It seems that it can also be transmitted by the bite of an infected cat flea. In fact cat fleas may be the most common method of transmission of the disease, which answers the question as to how best to avoid it – good flea control. The best form of flea control I think is to regularly comb your cat with a flea comb. This gives a chance to inspect, groom your cat, please your cat, get close to your cat and get rid of fleas (and see below). Some 7 to 20 days after being bitten or scratched the person feels like they have real flu, with a fever, sweating and aching joints etc. However the symptoms can be mild or severe. In about 50% of cases the area around the bite or scratch swells (see photo below but this may be a mild case). 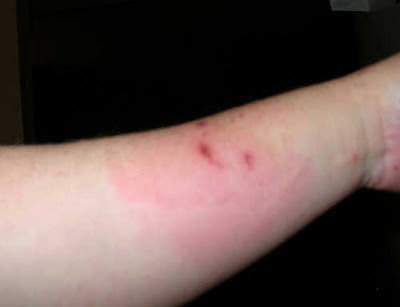 The whole limb (if bitten, as is likely, on a limb) can swell up and the lymph nodes nearest to the bite/scratch become swollen and tender (on the arm these are at the armpit). Cat scratch fever can last a long time, about 2 months, so it is quite serious. I have made an extensive list of some rare illnesses that can be caused by cat scratch fever: Cat scratch fever symptoms. Afipia felis (Bartonella henselae – a member of the fungi or yeast group). It is a member of the Bartonella genus of bacteria and very common. As mentioned above, flea control is important. That means firstly checking for fleas. In fact you can tell when your cat has fleas because she scratches too frequently around the neck, usually. Fleas also congregate around the base of the spine (at the start of the tail). 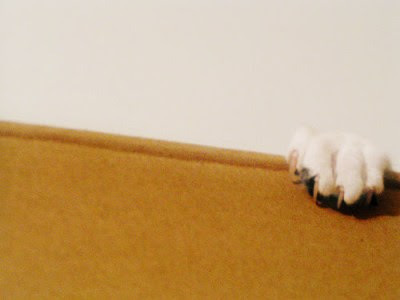 Your cat might also ripple her skin due to flea irritation. Flea comb regularly particularly if your cat is an indoor/outdoor cat or if you feed stray cats! If combing isn’t enough I use the dropper between the shoulder blades (top of spine). But this seems to make my cat sleepy. I would be reluctant to use any chemical treatment. Sprays etc. are out for me. Try and avoid scratches and bites through playing too hard. Beyond a point stroking can become play as cats become motivated to play if stroking is firm or in sensitive but nice to stroke places like the tummy. It’s nice to be licked by your cat as it is a sign from your cat of friendship and companionship but beware of licking a cut. If bitten or scratched by your cat wash it thoroughly with soap and water. This entry was posted in Human to cat relationship, Zoonotic Diseases and tagged Cat Scratch Fever by Michael Broad. Bookmark the permalink.